Hi everyone! 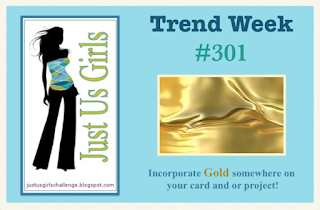 I've been inspired this evening by my friend Cheryl and her card for the Jugs challenge number 301 which is incorporating gold. Now I had to get a move on and quickly make a card and get it in by 9pm (it's 8.45pm now, I had to stop to eat dinner!) lol. Please click the Trend Week picture to be taken to the challenge page. I have to say, Wow! I adore the card that resulted! 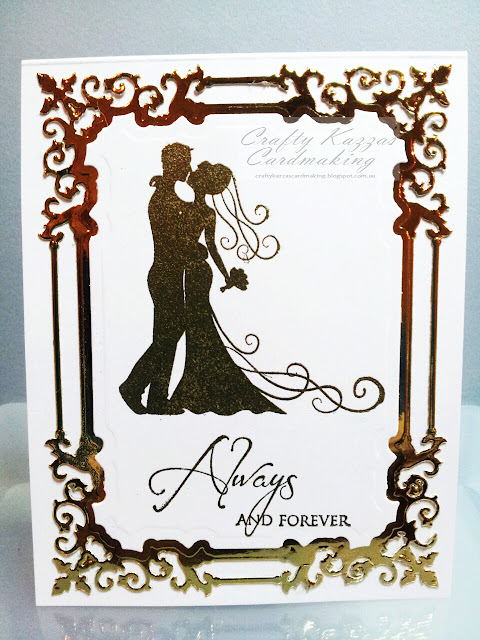 I used a stamp set by Gina K Designs, white and gold cardstock and two die cuts from the Spellbinders Shapeabilities Regal Frame. So without further ado, here is my creation! The most time consuming part of this card was trying to get the gold frame away from the rest of the cardstock (I put adhesive on the cardstock before cutting). I must say, all that fiddling was well worth the effort! I hope you like it, stay tuned for more cards being posted soon! Thanks for stopping by, I hope I managed to inspire you. Stunning card, Karen! So glad I was able to inspire you. To be honest, I didn't realise the challenge was so close to ending. But.... it is 9pm US time it closes, not Australian time. There's still another 12 hours to the challenge. You made it with time to spare! that's cool, I wasn't sure if it was our time or some other time. lol. Thanks, I love how this turned out, why don't we use gold more? It's so pretty! I know how gorgeous that stamp looks on a card and a shame it doesn't show when you photographed it. 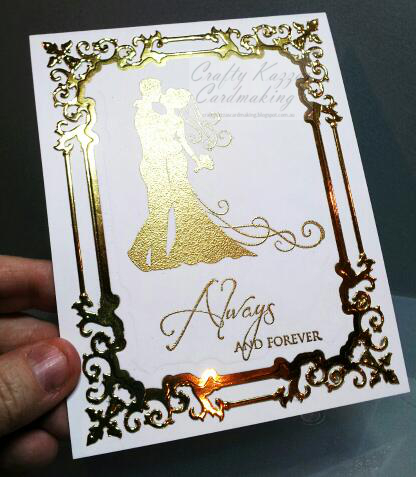 Your card is simply STUNNING in gold. That frame is just perfect. Love it Karen. Wow, this really is stunning! All that shiny gold is just so elegant! Thanks for playing with Just Us Girls! Thank you Lisa, I'm so going to buy more of that gold and silver cardstock I used, I love how it looks too! So beautiful and elegant with all of that gold! I love the frame around the bride and groom. Thanks for playing with us at JUGS! Thanks so much Sue. It all just fit perfectly in the frame, which was a lucky thing.